I’ve been trying to write the presidents letter for about a week now. Normally, when I write, I start about a week or so prior and then tweak it as the deadline approaches. This month I didn’t have that luxury as I didn’t even remember the letter was due until the reminder popped up on my calendar the day prior. Some of you know I lost my mom on April 13th. She has been battling a form of Parkinson’s for several years now and while we have been noticing the steady decline for several months, nothing can prepare you for the call from the hospice nurse stating that your mother has started her dying process. We were fortunate in that we had a week to be with her as her body left earth; yet that week was emotionally and physically exhausting like nothing I have ever experienced. Those of you that have been through it can relate, those of you who haven’t I’m not even going to pretend to try to express what it feels like because it is unlike anything I have ever felt or experienced in my lifetime. Needless to say, I’m still exhausted and therefore a formal presidents letter is just not going to happen. Up to this point (course of a week) I thought I would be able to eke out something. About an hour ago something a friend shared with me last night hit me like those ‘ah-ha’ moments do and I’m going to listen. She wrote on a piece of paper “Official Get Out of Guilt Free Card” valid until 4/13/2019. I’m not going to write a purposeful letter and I’m not going to feel guilty about it. Period. As coaches, we would coach our clients with the exact same kindness, encouragement, advice and gentleness. I’m pretty sure I’m the worst client ever yet this time, I’m listening. I hope you give yourself the same permission when you need it in your life. There was a lot of content to be shared this month so I do ask you to please read the entire Catalyst this month. There are a lot of updates regarding our May 8th ROI of Coaching event, the Prism Award and updating your member profile on the website to name a few. Be kind to yourself and I will see you on May 8th at the Metropolitan Ballroom. 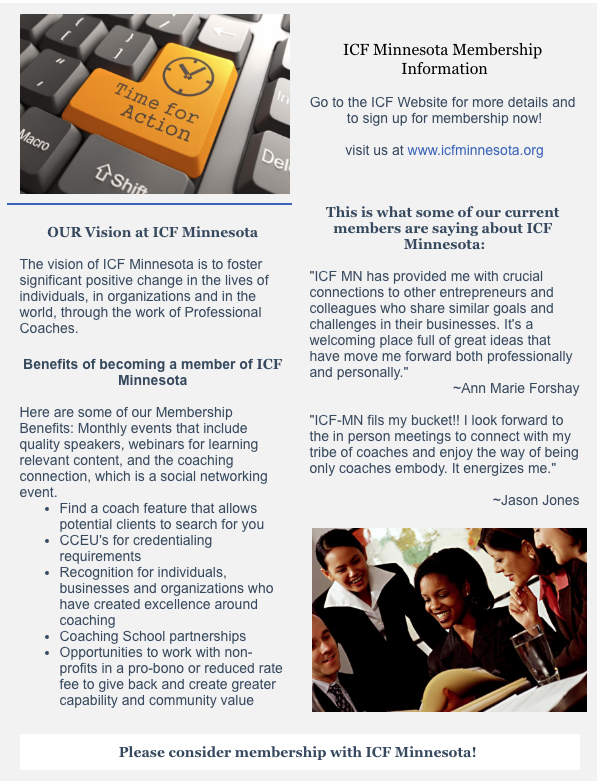 A friendly reminder to complete your profile on the ICF MN website Find a Coach section. Please upload a professional photo, contact information and specialty Area. This area is being looked at by potential clients and utilized. 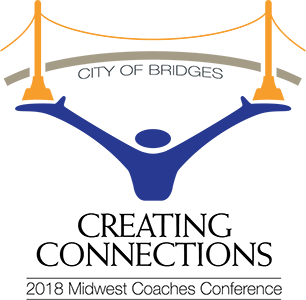 The Ignite Leadership team from the ICF MN chapter is looking forward to meeting with their Neighborhood House Liaison on May 9 for a mid-point check in. We anticipate hearing Director-level reviews that highlight shifts they are noticing within their organization because of the coaching that is occurring. At the same time, ICF MN coaches are submitting a midpoint evaluation showing their impact with their pro-bono clients to Carla Beach, Coach Liaison. Our cadre of coaches have been phenomenal, and the connection with Neighborhood House and ICF Foundation has been easy and supportive. These factors combined are making this a wonderful experience to date. Looking ahead, one of the strategic aims for this project is to showcase how coaching can impact organizations in our MN community. Specifically, the leadership team would like to highlight how coaching interventions create change in a cost-effective and positive way. In the months ahead, we hope to identify media channels for a possible story as it unfolds. Contacts appreciated! For questions or further information, you can contact members of the core leadership team: Christine Schwebel Chris@Tsoulnami.com, John Owens john.owens552@gmx.com and Joan Haan joan@joanhaan.com. Or review February’s Catalyst article or http://foundationoficf.org/home/ignite/. When it comes to leadership development, few tools are as powerful as coaching. Calculating the ROI on coaching is a different conversation. A quick Google search will report coaching ROI’s from 7 times to 1200 times. As coaches, we’re interested in the facts. Those facts include the process by which ROI is measured and the stakeholders who care about the data and results. 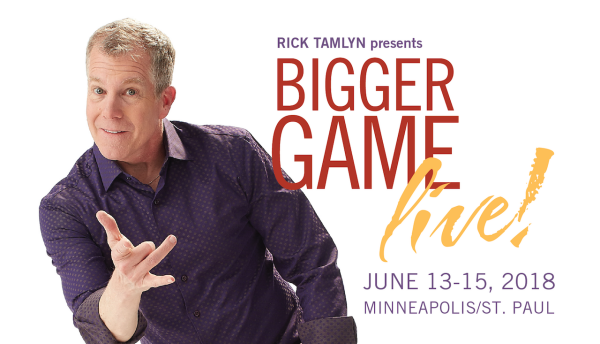 Join ICF Minnesota and a panel of coaches discussing how they measure success, their ROI formula, case studies and what matters most to clients and coaches. 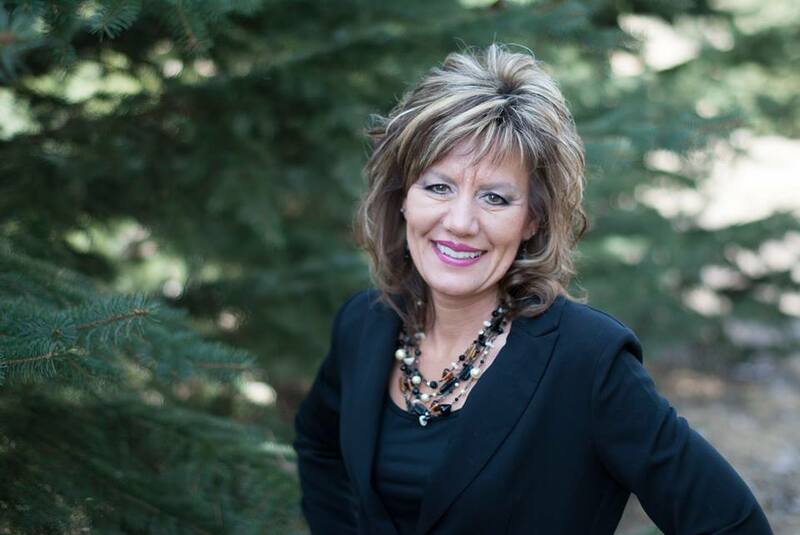 Judy Zimmer is the founder and president of Coachology.us, a national coaching, branding and speaking company. 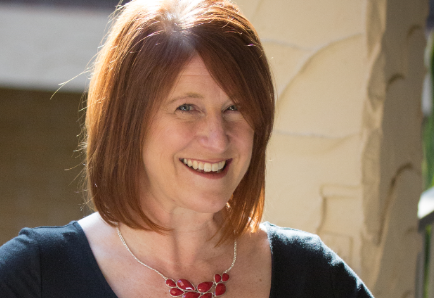 Judy holds three coaching certifications including Certified Effectiveness Coach, Certified Master Coach and Certified TIPS Innovation Profiling Trainer and Coach.